Curious why the traditional flower shop business has lost its bloom? Why is it way more profitable to have your business plan focus on the real floral moneymaker: Dried Flowers. Much like the traditional travel agency has gone the way of the horse and buggy, traditional independently owned floral businesses are fading fast. No wonder creative joyful entrepreneurs are jumping into the dried flower business. Just consider catchy flower shop names and you are in business. Take the case of Jan and Judy of Pittsburgh, Pa. Jan is an interior designer and Judy is a bookkeeper. Judy is nuts about flowers. She has giving dried flower bouquets as house warming gifts, to hosts and to the extended family as gifts for every occasion imaginable. Some 16-months ago Judy brought up to Jan the idea of starting a floral business combining artificial flowers and gifts into a specialty shop. They opened their company in a corner store downtown. They have not looked back since. I interviewed Judy to find out how they saw the advantages of starting their flower shop business. 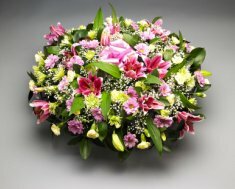 The Kroger Company, with its various supermarket brands, has become the nations largest florist. Other large retailers are also in the fresh floral market. Everyone seems to be making purchases based on time available and if it is easy to do. The supermarket is both. The mix of dried products available gives us literally unlimited creative spirit to design eye-popping arrangements…far more than fresh product would allow. This creativity draws customers to our shop. Featuring dried arrangements and unique gifts means that mass-retailers are not able to compete with us. This narrows the competition. We have what is called a destination-oriented business; i.e., a one-of-a-kind store that draws customer from 20 to 30 minutes away. Our dried floral products never wilt or die. Our waste is minimal. Our arrangments look and feel real. They are truly beautiful! This contributes to significantly more income opportunities for us. We are building our company by speaking before groups of all kinds just dazzling them with new creative ideas for the home. Meanwhile, none of our dried product dies, gets bent, broken or killed. After the event, it is returned to stock. Judy recommended using this resource prior to starting your non-traditional flower shop . As part of my Pay It Forward mission, I offer to assist you for free as you start and grow any online or offline business. I happily do this, in part, to thank all those who have helped me as an entrepreneur. Just click on my photo above. Judy is currently searching for how to create an effective website so they can reach national and international markets. She said, "Our products have unlimited shelf life and make for easy and low cost (light weight) shipping anywhere in the world. We are so excited by this opportunity! We expect this, in a couple of years, to be the major part of our income." I certainly agree with her!